« European Documentation Centres: what are they for, what is their future? 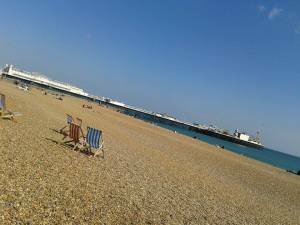 My personal reflections on the BIALL law librarians conference in Brighton. I attended BIALL’s 46th annual study conference from 11-13 June 2015 in Brighton. The conference theme was Charting the C’s: Collaboration, Cooperation, Connectivity. It was my 5th BIALL conference as a delegate, but 1st as a committee chair and speaker (see also BIALL Conference 2013). I arrived on the most glorious summer’s day, and Brighton had a definite feel of the Mediterranean. My first stop was the Justis Pre-Conference Party, which is often the highlight of any BIALL conference. This year we ate fish & chip at Victoria’s Bar on Brighton Pier, met up with friends old and new, and formed our BIALL conference ‘breakfast club’. The conference was opened by BIALL President Marianne Barber, who welcomed us to Brighton, and gave us ‘permission’ to miss a session to talk to suppliers, or enjoy a stroll along the sea front. This entry was posted on 18 June, 2015 at 11:06 am	and is filed under Service Delivery. You can follow any responses to this entry through the RSS 2.0 feed. You can skip to the end and leave a response. Pinging is currently not allowed.